Home Bedroom Furniture, Home Decor, Improvement & Appliances How to differentiate Between an Electric Skillet and an Electric Griddle? Both the electric griddle and electric skillet are useful home appliances; both come in handy when either cooking breakfast or dinner they always make the process easy and fantastic. They save on both the cooking time and the mess that accompany using a lot of frying pans or even the oven. They are both convenient and efficient to use when cooking and cleaning especially since most of the available appliances today are nonstick. This saves on the energy and time that is wasted and used for scrubbing and cleaning the appliances. While both are electric home appliances which are very useful to the chefs or the person using them they also have essential differences between them. Both are flat and have sunny surfaces that can be used to cook very similar meals, however, their differences make each to be well suited for a particular task in cooking and preparing various foods than the other .this differences clearly shows the difference between the two home appliances. This is an electric home appliance that has a big flat surface like a pan which is rectangular in shape and has no sides and is warmed with an electric heating device or firewood. An electric skillet is similar to the electric griddle thou it has a little wall surface and a cover that comes in hand. The skillet gives this simple modification compared to the griddle, and this wholly changes how these two appliances are put into use. The skillet can also sit on top of a table, and it gives warmth, and it heats up within minutes. The walls help to contain the food that is being cooked, and it’s also ideal when cooking food with liquid. Hence the skillet is designed for cooking and using sauces. The walls also make it easy to stir and mix ingredients with ease and without spilling. These walls are versatile hence they can be used to make a lot at one time. The skillet offers a lid which gives you a better-controlled cooking process. Therefore the electric skillet is the perfect cooking appliance and can save one when massive cooking is in hand or when an extra burner is needed. When looking at their differences, the physical difference between the two is not that much the electric griddle comes in a rectangle shape and has no sides or rather if it has the sides they are usually very short. The electric skillet in the other hand is a square or round shaped appliance which has higher sides and a lid or cover. Regarding size, the electric griddle is quite larger than the electric skillet for example when cooking pancakes one can be able to cook many pancakes at once on an electric griddle compared to the electric skillet. The griddle can accommodate up to eight pancakes whereas the skillet can only be able to accommodate up to four pancakes. Therefore the griddle offers more cooking space than the skillet. The prices of both the appliance also vary, though it is not much of difference the electric griddle price ranges from low to high that is a griddle can go for less up to 10 dollars to 99 dollars on various shopping sites. The electric griddle is colossal hence it requires a lot of storage space. It is not suitable for people with small kitchens as it will waste space that can be rather useful in other things. However comparing to the work, it is capable of doing it is worthy to take all the space it needs comparing to the electric skillet which is not large the skillet saves on space hence they are very suitable for kitchens which are limited in counter space as they can be put and fixed anywhere. The electric skillet offers more cooking options than the electric griddle, for example, the skillet can be used to cook fried dishes. The presence of a thermostat which keeps the temperature steady makes this possible. Also due to is walls it can be able to contain the oil that is being used to fry comparing this to the electric griddle though it can be able to keep the steady temperatures it cannot be able to hold the oil that is being used to fry as it does not have any sides. The presence of the lid in the electric skillet enables it to be used for boiling and simmering as it can hold in heat and moisture that is necessary to boil and simmer this cannot be achieved in the electric griddle as it has no lid to cover the top when cooking. 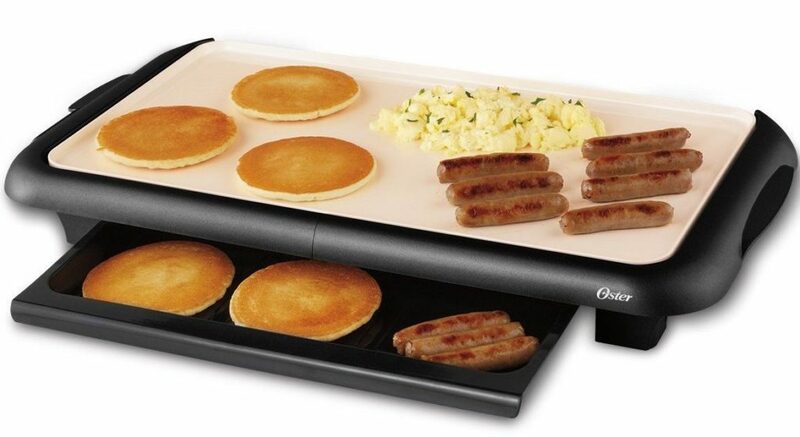 The electric griddle can be more versatile and accommodative. This is because some electric griddle can be able to accommodate reversible plates where the plates can be reversed to either a grill or a griddle. This can save one money and space in the kitchen as it can be used to serve two purposes rather than having two cooking appliances. The electric skillet though it’s versatile can only be used to prepare and cook a variety of meals but cannot be used to serve the purpose of another appliance. These two electric appliances have proven to be much use to homeowners when it comes to cooking, they are hustle free and can save a lot in terms of time and cleanliness as they save the filth that comes with other items used to serve the same purpose. Therefore they are handy and should always have a special place in all kitchens.